We are in the middle of LIFT 2014; the annual festival that is both glorious celebration of international theatre and sober reminder of the staid and conservative nature of so many Anglo-American creations. This can rarely be seen as starkly as in the spell-binding Opus No 7; concocted by the Dmitry Krymov Laboratory, it combines sublime beauty with haunting imagery to create a remarkable balance that allows a curiously harmonious co-existence of opacity and clarity. As it overwhelms the senses one is left with the impression that this is a performance that could not have been conceived of in this country let alone created here. Watching Opus No 7 is like working through a cryptic crossword clue. The explanation of the image is always tantalisingly close but remains impenetrable until resolved. There are no easy answers but one holds on to the images as they morph fluidly from one startling creation to another with faith that a narrative will emerge. Images coalesce until they suggest an idea. The piece is often without dialogue and usually underscored with the lightest of musical notes, faintly directing and reacting to the action. The first half is titled ‘Genealogy’ and tells the tale of the Jews in the second world war but with continually hints to the wider narrative of Jewish history and their earliest beginnings. Biblical reference points abound and their cast have a childish innocence that harks back to the earliest days of God’s children. They are nameless figures who slowly wander through their past claiming fragments – taking the form of letters, photos and memories – to shape their lost identity. They seem scattered to the wind, lost as individuals but finding each other as one finds ones community. They exist in a hinterland reminiscent of Beckett and the image of Krapp winding through his old tapes comes to mind as they pore through scraps of books becoming intrigued by the unfamiliar words, the sounds and shapes of names that no longer mean anything to them. Their innocence makes the desolation bearable. It does not take long to place the context of the scene and the point it is making, and as a results there exists a continual poignant reminder of what the show is trying to show. Yet, and back to Beckett, it is presented with an absurdity that cuts through the tragedy. This absurdity is seen in the sheer delightful inventiveness of the imagery and the meticulous work of the cast to bring alive the inanimate. A painted wall becomes a family, coats come alive, exploding books; it sounds painful but the truth is a production that captures perfectly the point where performance and theatre come together. This is a narrative told through imagery. It requires physical acting of the highest calibre and a visual eye as good as any painter (and is it any surprise that Krymov has an artistic pedigree the equal of his theatrical one?). The second half – focused on Shostakovich – struggles to maintain the fluency of the first but makes up for it with two wonderful set pieces. 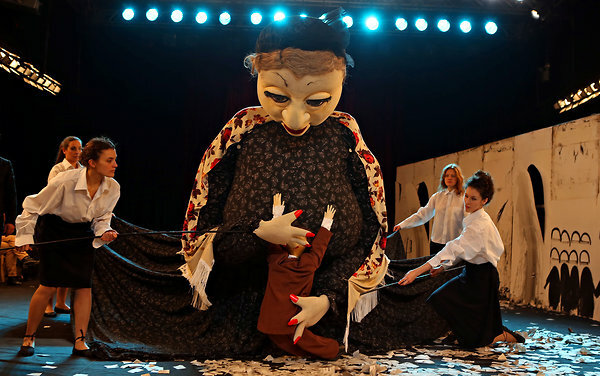 The first is a huge puppet that acts as both ‘mother’ and ‘mother Russia’. It is a cute set-up that shows that the maternal smothering instinct for Shostakovich, and the Russian people, has never been far away. At another point it is represented by a long snaking arm that encircles the composer, strangling and lauding him in equal measure and reminding him; as always that the Russian state can reach him anywhere. Opus No 7 is an experience in effortless inventiveness, experimental theatre-making but on a grand scale and with complete control. It exists as both cutting-edge and in the mainstream. The grand traditions of both sides of the Atlantic will always set the agenda in the West End but in theatre, as in so much of life, one should never forget about the potency of the Russian Bear.